to overcome the distrust or hostility of; placate; win over: to conciliate an angry competitor. 2. to win or gain (goodwill, regard, or favor). Conciliation means bringing two opposing sides together to reach a compromise in an attempt to avoid taking a case to trial. Arbitration, in contrast, is a contractual remedy used to settle disputes out of court. Clan Crozier. 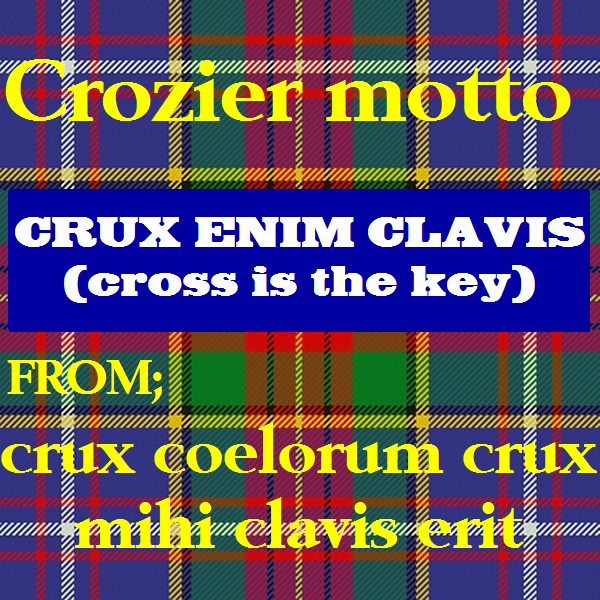 Clan Crozier (crosier, croser, etc.) 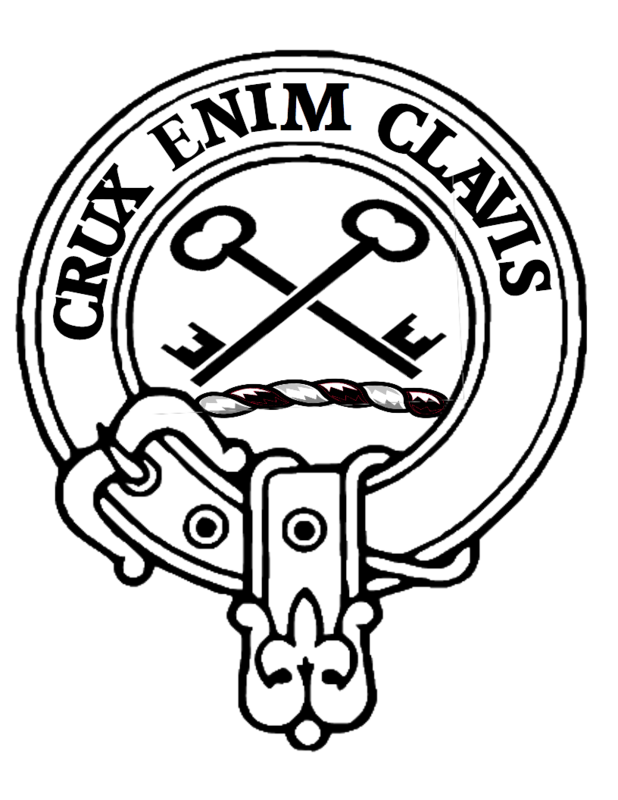 is one of the border reiving clans of Scotland, along with the Armstrongs, Elliots, and Nixons. Some sources cite the surname as a sept of the Armstrong clan, but the Scottish parliament in 1587 identified the Croziers as a middle march clan. The Croziers came from over from Normandy in 1066 with William the Conqueror. Through the years, some moved northward to the southern areas of Scotland where they became established as a Border Clan. According to Scots Kith and Kin, Clan Crozier was in Liddesdale in the 14th Century. It is a sept of Clan Armstrong. a clan, originally one in Ireland. So, sept is in reference to an Irish Clan. In Latin based language sept refers to seven, as in September had been the seventh month. Tried twice to list the Crozier as an Clan Armstrong sept on English Wikipedia, but it was accepted as an ally. Clan Crozier, is not being recognized as an ally on Clan Eliott English Wikipedia. far more populous Clan Armstrong. Brought on by not being able to list Clan Crozier as a sept, but as an ally on English Wikipedia. With sept being Irish and not Scottish for clan, and the Crozier a strong name in Ulster, Ireland, may be the reason Crozier think they are a sept of the Scottish recognized unvanquished Clan Armstrong. 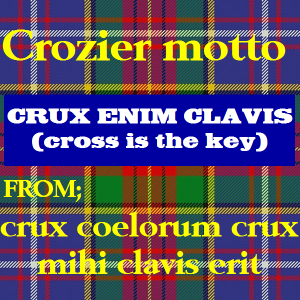 Both that given by New Zealand and known for wool especially the given tartan, to standardize the colourisation for CLAN CROZIER, with high hue border Scottish blue, and the green of the Armstrong and Ireland. A Clan must have a Tartan of standard colours (colors) to be first recognized as A Clan. New Zealand it is felt has given the best representation of these colours. For the question of sept or ally? 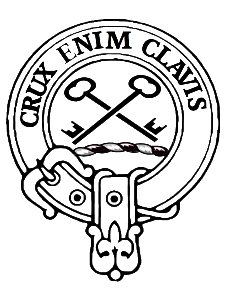 It is felt if Nova Scotia can convince Clan Armstrong that Clan Crozier is a sept and not an ally, then Clan Crozier can be a sept of Clan Armstrong. If the Clan Armstrong considers Clan Crozier an ally then they are an ally of Clan Armstrong. 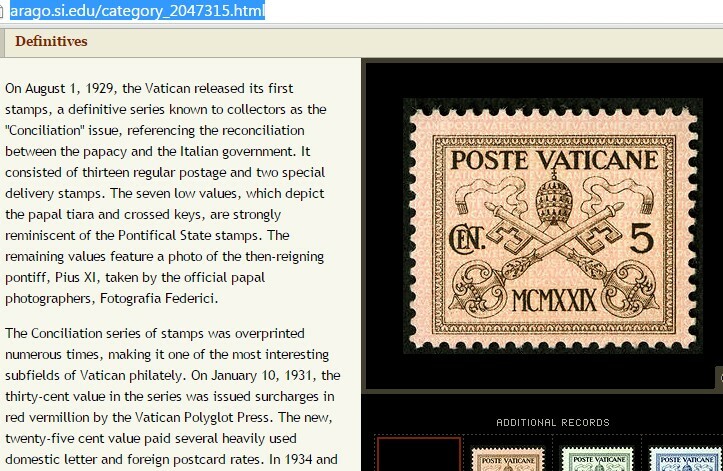 Above has a key and a crosier in background which are crossed. 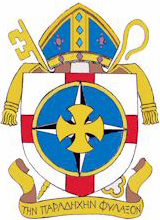 Papal Coat of Arms since twelfth century. Keys in the form of the cross of St Andrews. To fit on clan belt. New Zealand had a shorten motto.